Melbourne Heart’s fine form under John van’t Schip continued as they, the bottom placed side, triumphed over the league leaders. After last week’s 5-0 thumping of the Wellington Phoenix, Van’t Schip only made one change, moving Patrick Gerhardt into the centre of defence and bringing Jonaton Germano into midfield. He kept with the 4-3-3. Mike Mulvey had the benefit of being able to bring two of his first-choice midfielders, Matt McKay and Liam MIller, into otherwise the same side that fell to Newcastle Jets last Sunday, with Henrique for Dimitri Petratos on the right the only other change. It says much about the relative evenness of the A-League that despite this being 10th v 1st, it was difficult to predict the result of this fixture, especially considering the two side’s most recent results (Heart, of course, having smashed Wellington 5-0 and Brisbane succumbing to Newcastle for the third time this season). In a tactical sense, too, this game was evenly matched, because of how Van’t Schip has switched from Aloisi’s preferred 4-2-3-1 to a 4-3-3, with a physical, combative midfield trio that is well suited to matching up against Brisbane’s famed possession game. That’s not in the sense that the Heart would try and compete in a ‘battle for possession’, but more because Massimo Murdocca, Orlando Engelaar and Germano could take turns to press Brisbane’s midfielders, knowing there was cover in behind. In terms of approach, the Heart continued with the counter-attacking that has served them well against Brisbane in the past – most memorably in a 4-1 win near the beginning of the 2012-13 season – and with a pacy front trio able to break quickly at transitions, they looked constantly dangerous on the break. Indeed, Brisbane finished 62% of possession, as per usual – but this was a good example of when that dominance can be sterile, as was the case against Newcastle last week. Instead, it was the counter-attacking side that looked most dangerous, with Heart constantly working the ball out to David Williams, Iain Ramsay and Mate Dugdanzic, who carried the ball forward purposefully, particularly down the flanks. Because of this, the Heart often bypassed the midfield zone when in possession, instead hitting the front trio with long, direct passes, with Williams on one occasion forcing Theo out of his box to make a rather harried attempt at sweeping up. Heart’s directness was also stemmed to Brisbane’s pressing – Berisha worked hard to close down the centre-backs, and in fact Kisnorbo passes back to his own keeper rank as the Heart’s highest pass combination. The key battleground, however, was in midfield. Heart’s trio were happy to rotate between left, right and centre – but generally Germano was the deepest player, with Murdocca slightly ahead to his right and Engelaar making powerful runs from a left-of-centre position. He was constantly driving Heart attacks forward with his strength, but also dropped back to help Aziz Behich down that left-hand side – particularly important because of the way Ivan Franjic gets forward from right-back, and how that can be difficult for Ramsay to track over a long distance. Furthermore, with Engelaar shuffling across to that touchline, Ramsay was free to sit slightly higher up the pitch than Dugdanzic, meaning the former was often free as the outlet for counters – both Germano and Murdocca attempted to hit quick diagonals towards him, as if releasing Ramsay in space was a specific tactic. As it were, he got in behind early on and forced Michael Theo into a smart low stop, but was from then on generally nullified by Franjic and Jade North. Heart’s 4-5-1 in defence made it difficult for Brisbane to play through – unsurprisingly, the Brisbane back four and midfielders dominated the passing statistics, as they passed it across the middle third looking for gaps – and a number of physical challenges in the first half set the tone, with the Roar attackers finding it difficult to generate space in the final third. Engelaar’s size summed up Heart’s approach – break up play in midfield, then charge forward on the counter, and it was unsurprising that he, as the player leading those transitions, popped up with the goal. Heart’s physicality – and more specifically, height – also caused problems at the other end, with set-pieces proving a major threat for the home side. As noted by the commentary, the simple size mismatch was an enormous advantage, especially from corners, where Engelaar and Patrick Kisnorbo both had good headed chances. 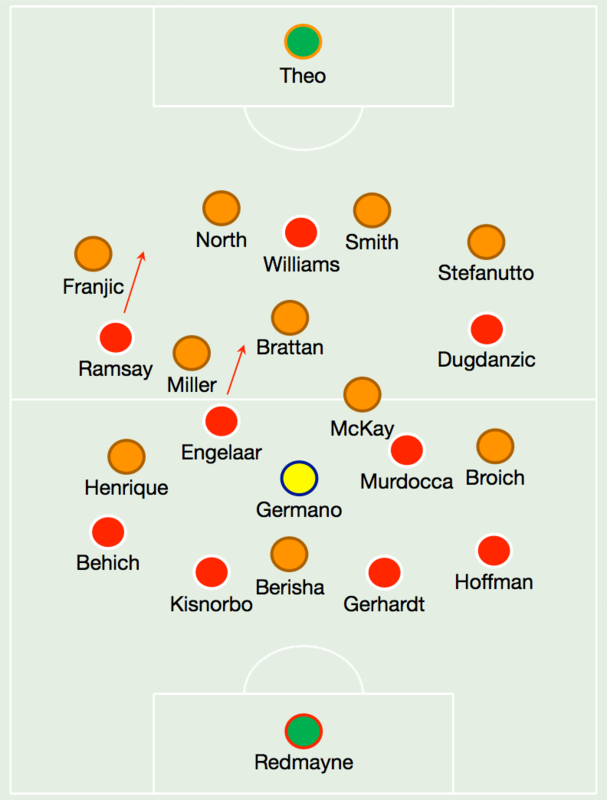 Still, there were moments when Brisbane looked dangerous, particularly down their left, because of the variety and number of attacking threats that had coming down that side – Stefanutto overlapping energetically, McKay darting forward into dangerous positions and Broich typically drifting inside to find room to create. However, the major theme (and most noticeable feature of the match) was Berisha’s varied positioning – he was constantly on the move, predominantly dropping into midfield but also drifting wide. It’s unclear whether this was an instruction from Mulvey, or simply a search on Berisha’s part for service, although the latter seems more likely. Berisha likes to take players on, and often when collecting possession in deep positions looked to knock the ball around defenders and use his body to protect it – but his poor first touch, often back towards his own goal and overhit, means it’s easy for the marker to get goalside of him and jockey him wide. Furthermore, Berisha was constantly hounded by Kisnorbo and Gerhardt, who followed him into deep positions and defended in a remarkably proactive manner, with the former at one point thirty metres ahead of his centre-back partner — something we’ve seen before from both players, but still a bold tactic. Generally, this tactic was successful, although Gerhardt was booked when given the slip by Berisha – that was the exception rather than the rule, however. The Heart started more on the front foot in the second half, attacking in waves and building pressure on Brisbane’s goal. That exaggerated Engelaar’s positioning, and he seemed like an out and out attacking midfielder for the first twenty minutes of the second half, staying high up the pitch to win long balls from the back and invite runners from midfield. Although Brisbane recovered to hoard possession once more, it always felt like Heart were the more dangerous sides – their attackers were constantly getting into good positions, and as best illustrated by the goal, cut-backs from the by-line were always threatening because of the runners coming from midfield. Considering how attacking Mulvey had been with his substitutions last week, it was surprising that Brisbane’s first change didn’t come until the 75th minute, with Petratos replacing Henrique – the like-for-like swap contrasting with the helter-skelter attacking changes against Newcastle. Perhaps Mulvey was wary of how that seemed to unbalance the side, who then appeared uncertain of their roles. His second change here was to introduce more height in the form of James Donachie (with Franjic moving into the substituted Miller’s position) – a change designed to stop Heart’s constant threat from set-pieces, although with Engelaar taken off a few minutes later, it felt like that element of the match was no longer significant. Van’t Schip, for his part, made like-for-like changes – Kalmar for Germano, Ben Garuccio for Ramsay and Stefan Mauk for Engelaar. A game made interesting by the clash of technical v physical, as Brisbane struggled to generate penetration from their possession against the Heart’s energetic, combative game plan – in essence, packing players into the midfield zone, and then breaking quickly through pacy attackers. Engelaar’s height and power proved crucial in both directions, as he broke up play, created chances from set-pieces and lead counter-attacks, scoring the game’s only, decisive goal. A second successive defeat for Brisbane has raised concerns about the sterility of their possession-based game in recent weeks. Berisha probably didn’t help in this regard – his constant movement causes problems for defenders because it makes him so difficult to track, but because he was barely running off the shoulder of the defence here, it was easy for the Heart centre-backs to follow him into deep positions, with no one taking advantage of the gaps that created in the back four.